Activists protest Swedish journalist Donald Bostrom, who accused Israel of stealing organs from dead Palestinians. Israeli Ministry of Health: Practice is "an old story that ended years ago"
Jerusalem (CNN) -- Israel harvested organs from bodies in the 1990s without permission of family members, the former head of a state-run forensic laboratory said in a newly released interview. Government officials acknowledge that the practice happened, but emphasize that it ended years ago. In an interview in 2000, which was released to an Israeli TV channel and broadcast over the weekend, Dr. Yehuda Hiss -- who was once head of the Abu Kabir forensic institute -- discussed the practice. "We started to harvest corneas for various hospitals in Israel," Hiss said in the interview on Israel's Channel 2 network. "Whatever was done was highly informal. No permission was asked from the families," he said. Hiss said the harvesting also included heart valves, skin and bones. He was speaking to an American researcher, who recently gave the tape to the Israeli network. An Israeli Ministry of Health spokeswoman, Einav Shimron-Grinboim, issued a statement saying the practice discussed in the report was "an old story that ended years ago" and that in the vast majority of cases, the actions were done to Israelis, including soldiers. Procedures were not clear at the time and have since been clarified, she said. None of the practices led to charges, she said. The report said organs were at times also harvested from Palestinians and foreign workers. In the interview, Hiss was asked about the legality of such practices. "It wasn't clear," he said, adding that he thought families were supposed to be asked for permission. After getting permission from family members to perform an autopsy, "we felt free" to harvest organs, he said. Organs were not harvested if it was believed relatives might discover it, he said, adding that in some cases glue was used to close eyelids to hide missing corneas. The report included a statement from the military, the Israel Defense Forces, saying the activity ceased a decade ago. The report also described how for years the Abu Kabir institute, "supplied not just tragic passing announcements but also news about organs donated for transplants which saved the lives of hundreds of patients." The report comes four months after a different allegation about organ harvesting in Israel. An opinion piece published in a Swedish newspaper in August suggested the Israeli army kidnapped and killed young Palestinians to harvest their organs in the 1990s. The writer, Donald Bostrom, told CNN he had no proof that Israeli soldiers were stealing organs, and that the purpose of his piece was to call for an investigation. The article triggered a dispute between Sweden and Israel. While the Swedish Embassy distanced itself from the report, the country's foreign ministry refused to condemn it, saying Sweden has a free press. 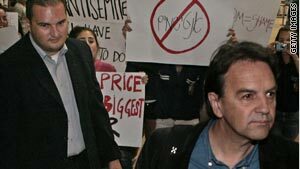 Israeli Finance Minister Yuval Steinitz called it "an anti-Semitic blood libel against the Jewish people and the Jewish state." It was after hearing about that uproar that American anthropologist Nancy Scheper-Hughes, a professor at the University of California at Berkeley, decided to release the tape of the interview she conducted with Hiss in 2000, Israel's Channel 2 reported. Scheper-Hughes told the network that she does not believe Israel murdered Palestinians for organs. But the admission of harvesting organs, including skin, at times from Palestinians, struck her, she said. "The symbolism of taking skin out of a population that is considered to be the enemy and using it for skin for the military, that's something that -- just in terms of symbolic weight -- has to be reconsidered," she told Channel 2. Hiss could not be reached for comment. Earlier this year, there was another unrelated controversy involving Israel and organs. In July, U.S. authorities charged a New York man with trying to arrange the private sale of a kidney from a donor in Israel.